Scotland’s container terminal, within the Port of Grangemouth, continues its multi-million pound investment programme with the announcement of the purchase of three new straddle carriers. The new ESC340 straddle carriers represent another significant investment for the port and will be delivered at the end of the year by port infrastructure equipment specialists Kalmar. The purchase of the new straddle carriers – which are specialist machines for manoeuvring containers within the port – will increase the fleet at the container terminal to 16 and represents the first stage of a phased fleet modernisation initiative which will in time replace the entire fleet. The purchase of the new straddles is part of a major investment programme at Scotland’s container terminal to increase its capacity for storing both conventional containers and reefers (refrigerated containers). 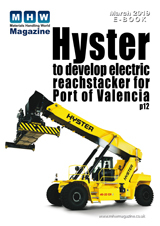 In December 2015, the port announced the delivery of a new fleet of 15 Hyster forklift trucks which have replaced the port’s existing machines. Resurfacing work at the terminal has been completed with the creation of heavy duty concrete paving with additional storage lanes for laden containers in addition to improved equipment access to landside and shipside operations. The investment has increased the busy container terminal’s total storage yard capacity to 12,000 TEUs (the industry standard container size of twenty foot equivalent units) – a 50% increase since 2005. More than £6 billion worth of goods passes through Grangemouth each year including steel plate, timber, paper and equipment for the oil and gas industry. Grangemouth container terminal reached its 50th anniversary on 7 May 2016.